Today is the Feast of St. Maximian, Patriarch of Constantinople. He was born in Rome of wealthy parents and used his inheritance to provide tombs for those who led holy lives. He preferred a simple, unadorned life, which actually caught the attention of Sisinius, who was Patriarch of Constantinople from A.D. 426-427. Maximian was ordained as a priest. After the heretic Nestorius was deposed as Patriarch of Constantinople in A.D. 431, St. Maximian replaced him. He then died peacefully in A.D. 434. 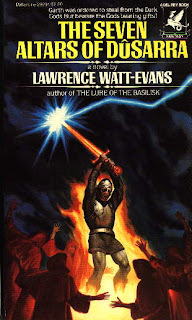 In a round about way, the life of St. Maximian reminds of one of the more influential books in my own personal Appendix N: The Seven Altars of Dûsarra by Lawrence Watt-Evans. 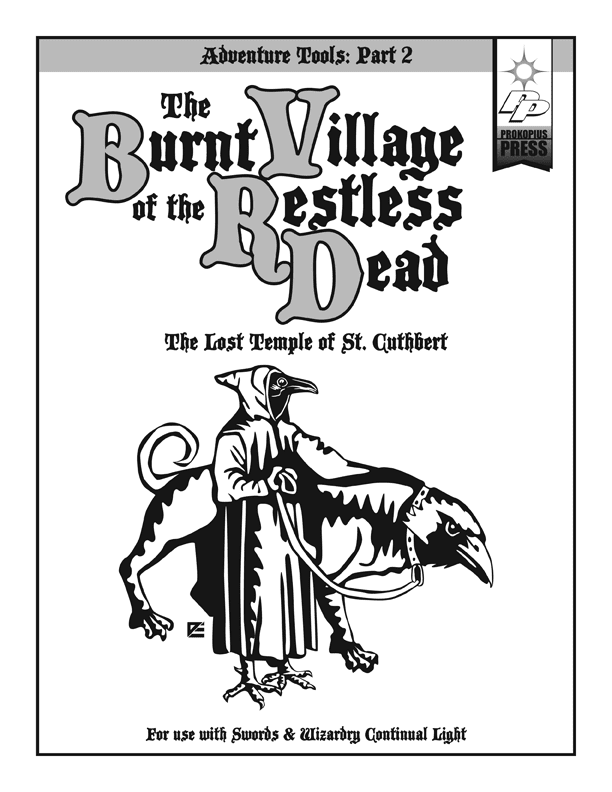 In this particular tale, the protagonist is sent off to steal whatever is on the seven altars from the title of the book. 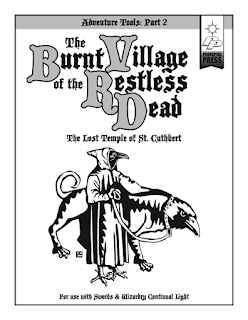 Each altar was from a different temple dedicated to one of the “Lords of Dûs” — gods of darkness. In a reverse of this structure, a campaign inspired by St. Maximian might center around the idea of seven lost temples. In the high days of Civilization, during the reign of a Maximian-like ruler or religious leader, great temples dedicated to the saints (literally “holy ones”) were built all across the Empire. When the Empire collapsed, seven of the greatest of these temples were “lost” — they now lie in lands claimed by the forces of Chaos. The locations of some are well known (i.e. the ones corresponding to lower level adventures) while the locations of others are lost to the mists of time (and/or might have been moved by some great feat of magic which may very well have been the catalyst for the collapse of the Empire). The campaign, then, would center around the recovery of seven relics, each associated with one of the seven temples. Fill in your favorite trope here as to why these relics need to be recovered. One that I might be tempted to use is that should all seven be joined together something extremely powerful can be made and various factions have recently come upon the blueprints to make it all possible. Thus, everyone is in a race to secure all seven relics. Today is the feast of the Holy Martyrs Anthony, John and Eustathius of Lithuania. 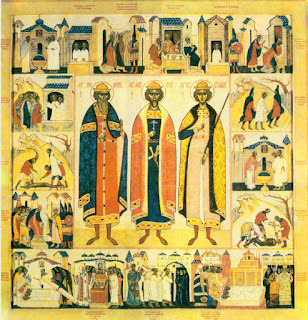 During the reign of Prince Olgerd, these brothers became Orthodox Christians due to the influence of Princess Maria Yaroslavna, Oglerd’s wife. After her death, however, Olgerd turned toward paganism and persecuted the Christians. Imprisoned and tortured, they were all hung from an oak considered sacred by the pagans. Later, the Christians built a church at the site and the stump of the tree became the altar. This all took place during what can called the Northern Crusades, a fascinating and criminally ignored history. 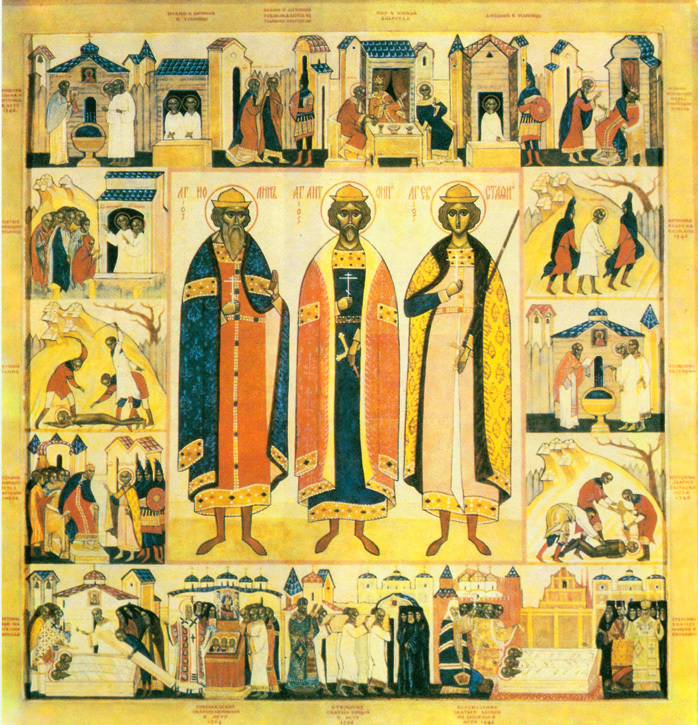 Beginning in the 13th century, Bishop Albert of Riga founded a military order called the Livonian Brothers of the Sword (sometimes referred to as the Sword Brethren). 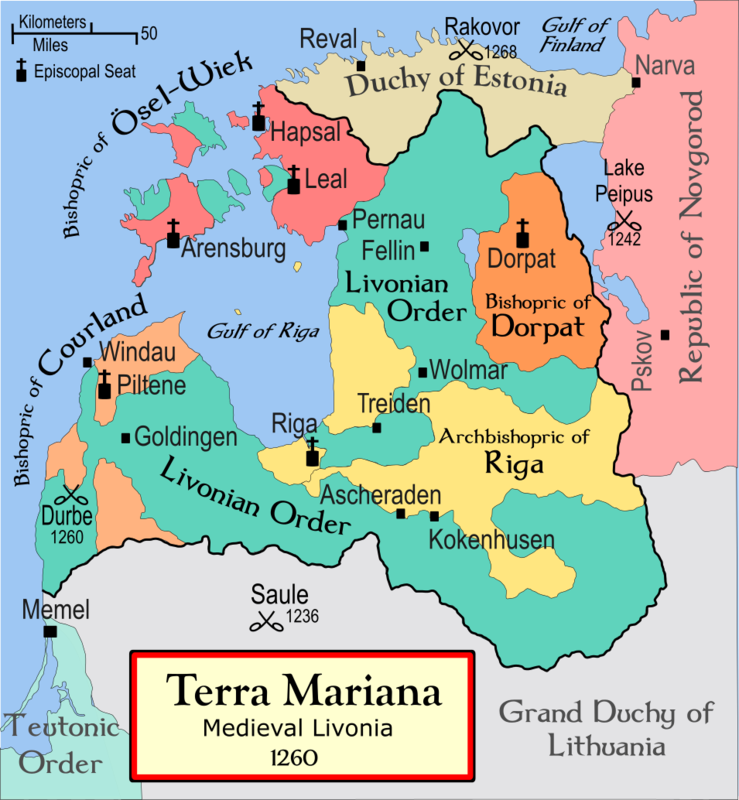 Sanctioned by Pope Innocent III, this group of German warrior-monks were established to aid in the Christianization of the pagans in what today is Estonia, Latvia and Lithuania. Politically, they were there to aid Albert carve out a fiefdom granted to him by Philip of Swabia who laid claim to be Emperor of the Hohenstaufen Holy Roman Empire. 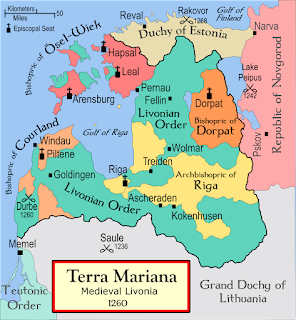 In the end, they suffered high casualties and were absorbed into the Teutonic Order as an autonomous branch called the Livonian Order. It was this order which clashed with the Alexander Nevsky-led Novgorod forces at the Battle on the Ice — so-called because in the swampy environs of the Baltics, winter was campaign season because the frozen ground was the best time to move troops. Lake Peipus was frozen over and was perfect for a calvary charge. In terms of influential movies on me, Sergei Eisenstein’s Alexander Nevsky has a pull than is even stronger than Star Wars. I saw both in my youth and both have lasting visual, emotional and musical impressions that still resonate will me today. 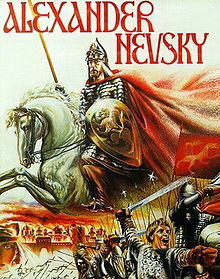 I don’t think I would have been as enthusiastic a D&D player as I still am today without Alexander Nevsky. You have competing bishops, competing denominations of Christianity, you have militaristic monastic order, pagans and lurking off the map the Golden Horde ready to wreck havoc. I would love to see the chaos caused by a group of players in a political situation like this. As an aside, for those who argue there are no historical examples of the D&D cleric, look no further than this period of history where the concept of the “battle bishop” is not very far from the truth.